Take your home improvements to the next level with the Ryobi folding work table. Offering DIY enthusiasts the ultimate in convenience and practicality, this work table is designed to give you a sturdy work surface for a variety of applications. You'll love the less than 30-second setup time, so you can get to work quickly and easily. Dimensions are 850mm x 550mm x 755mm, giving you enough surface area to tackle most tasks. Locking structural support gives you extra piece of mind when you use your power tools — this work table is strong enough to help you do everything from trim down wood for carpentry to cut designs into materials with precision and accuracy. 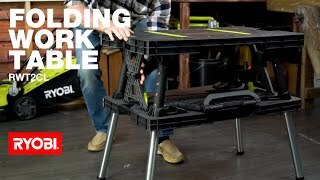 Get the Ryobi folding work table from Bunnings Warehouse today.